ALMEIDA MARTINS COSTA, Domingos de. Rio de Janeiro, Typographia Academica, 1879. 8vo. 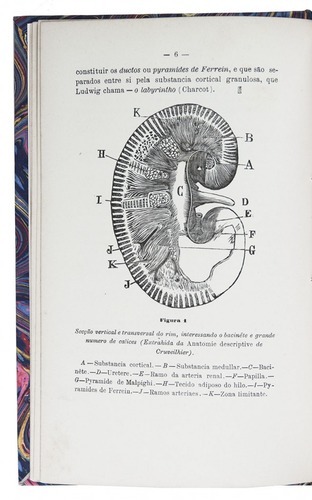 With 2 woodcut illustrations (a cross-section of a kidney and a representation of the urinary tract) and a full-page letterpress table of medical data. 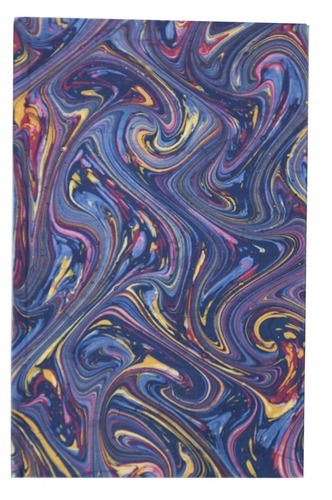 20th-century marbled boards. 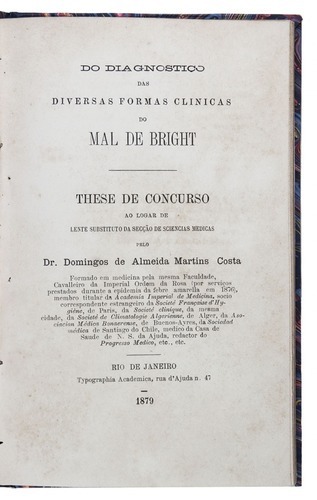 An extremely rare thesis on nephritis (Bright's disease), an inflamation of the kidneys, from the Imperial Academy of Medicine in Rio de Janeiro, printed and published by the Academy's press. It opens with a 20-page introduction, followed by case reports of several forms of nephritis. Domingos de Almeida Martins Costa (Maranhão 1851 - Petrópolis 1891) was a Brazilian physician who contributed greatly to Brazilian cardiology. The back of the half-title lists 8 of his publications, all published in Rio de Janeiro in the years 1874 to 1678. WorldCat lists the present edition, but without giving any location. The only other copy we have located is at the Complutense University in Madrid. With minor foxing and browning, but still in good condition. A very rare medical thesis printed and published in Rio de Janeiro. REBUIN (1 copy); WorldCat (without any location); no further copies in KVK; not in Biblioteca Nacional do Brasil; Porbase.